Just what exactly are MS20257 hinges? MS20257 hinges are fully-defined on the specifications available here, and are summarized as follows; MS20257 Hinges are tremendously precise and reliable piano hinges often utilized in the aerospace, defense, transportation, healthcare, and electronics industries, as well as countless other demanding industries and applications. MS20257 are not to be confused with generic piano and continuous hinges of similar dimensions. Only piano hinges carrying MS20257 identification meet the exacting tolerances, and stringent requirements called for by the specification. The MS20257 family of continuous hinges are not only tremendously precise, they are far more cost effective than their most similar counterpart in precision- extruded piano hinges. Unlike extruded and machined piano hinges, MS20257 hinges are manufactured using much more scalable techniques, enabling great precision and reliability at far lower cost. MS20257 hinges are available in mill finish 5052-H34 Aluminum, and 304 2B Stainless Steel, as well as Anodized (per Mil-A-8625 Type II) 5052-H34 Aluminum. The hinge pins of the MS20257 are 302 Stainless Steel, and by design must meet the MS20253 specification. Stainless Steel MS20257 hinges are fitted with Passivated MS20253 pins, and aluminum MS20257 hinges utilize Cad-plated MS20253 pins, resulting in extremely strong corrosion resistance. For the MS20257 line, LaDeau Manufacturing utilizes only Certified American-sourced material to ensure the highest quality, from melt to application. The MS20257 is available in thickness ranging from 0.032” (0.81mm) to 0.062” (1.57mm), and pin diameters ranging from 0.062” (1.57mm) to 0.179” (4.55mm). Most of the MS20257 line features 0.50” (12.7mm) knuckles, with the exception of -6, P6, and C6, which have 2.00” (50.8mm) knuckles. 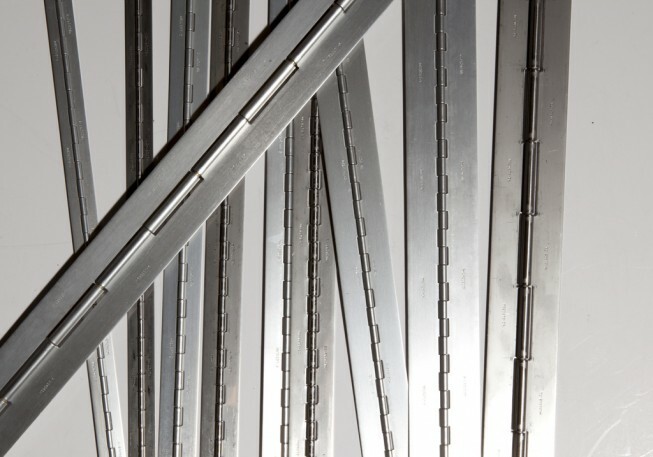 Open widths range from 0.75” (19.05mm) to 2.00” (50.8mm), and all types are stocked in 72” (1828.8mm) lengths. Shorter and longer lengths are available, and any manner of customization is available for MS20257 hinges. In fact, many custom hinges for critical applications begin with an MS20257. Additional information on MS20257 piano/continuous hinges is available on the product page here, and the original specifications here.